Telescope Snails belong to the Horn Shell family. The Horn Snail Shell family (Potamididae)(gastropods) has only a few species. They are seen across the Indo-Pacific region from the Indian Ocean east to the Northern Australian/New Zealand shores. They prefer mangrove swamps and mud flats. Some species may gather in the thousands. 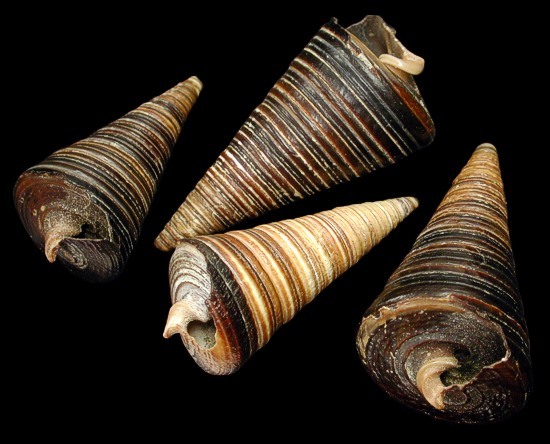 The Horn Snails are dull colored solid shells. Their spiral whorls are usually ornamented with ribs and tubercles. The base of the outer lip curves toward the siphonal canal. Species: Telescopium Telescopium Linnaeus. This is a heavy tall straight sided shell. It can be mistaken for an elongated top shell. The flat base is separatedfrom the columella by a deep channel. Its uneven aperture descends in a sweeping curve with a basal projection. It has a shallow suture and is difficult to distinguish from the edges of the flat spiral ribs encircling the whorls. One narrow rib and three wider one per whorl. It is rare to see this species have more than 16 whorls. The color is light brown, white or gray banded. The bands of lighter color sometimes relieves the shell's uniform dark brown color. The tips of the snail are usually blunted.